Nutrition facts for coffee? Who knew! They make for fascinating reading and great news for coffee lovers! Who would have imagined that coffee could be so good for us? Our daily “fix” it turns out is full of antioxidants! In fact, of all the foods in the typical American diet, it could be the BEST source for antioxidants that we regularly consume. Not only that, but the more you drink the more profound the health benefits. Well, maybe not this much! I was amazed at the number of studies I found in the research on nutritional aspects of coffee. There are actual nutrition facts for coffee. But what about caffeine side affects? 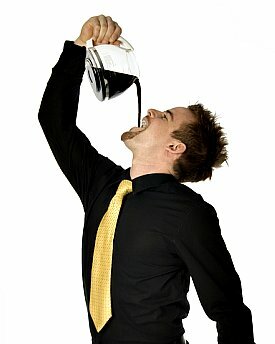 Caffeine is a naturally occurring compound but it is a stimulant. Large amounts, more than 250 mg. a day, can cause restlessness, insomnia, heart palpitations, nervousness, irritability and even headaches. Even worse, since caffeine stimulates the adrenal glands which release blood sugar into the bloodstream, it triggers blood sugar spikes. It can lead to sugar cravings and over time to insulin resistance. This is the main reason drinking coffee has not been a good idea for weight management. Now I’m reading that four – twelve cups, yes you read that correctly, twelve cups of coffee reduces the risk of the killer diseases? Talk about mind boggling nutrition facts for coffee. What’s going on here? Twelve cups of coffee could lead to more than a few heart palpitations if not a complete melt down of one's nervous system. Not only could drinking a whole pot of coffee cause havoc with your blood sugar but how about hypertension? At the very least drinking a dozen cups of coffee means a serious case of shaky hands and some serious time in the bathroom. But, it IS true there are many beneficial plant compounds including antioxidants in coffee. So what to do if you want the very real disease protection benefits and even weight loss benefits? This is where the right coffee comes in. Today there are coffees roasted and formulated to decrease the negatives and increase the positive benefits. I told you there are real nutrition facts for coffee. First about the science - the nutrition facts for coffee. Now we're talking some bona fides nutrition facts for coffee. Just one cup of coffee a day can reduce the risk of stroke and depression in women. No wonder it's hard to face the world until you've gone to Starbucks. At higher amounts of coffee consumption (four cups and more) most chronic diseases including cardiovascular disease, cancer, diabetes, liver disease and Alzheimer’s can be avoided. But that's a lot of caffeine and over the 250 mg. that causes caffeine toxicity. Oops. One cup of coffee contains about 95 mg. of caffeine. If you are sensitive to caffeine three cups is too much. Will drinking less coffee do much for your health? The short answer is no. Clearly all coffee doesn't do this because not enough of the plant compounds, especially the chlorogenic acid, which is the potent antioxidant in coffee, are available in commercial coffees. So how do you get the right coffee that retains more of these plant polyphenols that have such amazing health benefits? There is a way to get the health benefits without the negative caffeine side affects some people experience with drinking high amounts. Yes! There's a way to get the extra energy boost, elevated mood enhancement affects and increase in metabolism and not fry your adrenals. All of this new research has encouraged at least one company to find a way to get much more of the beneficial plant compounds called polyphenols into the coffee. Just like with all foods, nutrition facts for coffee tell us that too much cooking destroys the nutrients. With coffee, over roasting eliminates the healthy plant polyphenols and some coffees retain too much acid in the roasting process. The most beneficial ingredient in coffee, the chlorogenic acid, is cooked out! There are coffee beans processed with a new patented roasting process that retains the nutritional antioxidants and other health promoting plant compounds. If you have a sensitive gastrointestinal system this new plant polyphenol retaining coffee is less acidic and less likely to cause heartburn or other digestive issues. If you are extra sensitive to caffeine, you can buy it decaffeinated and processed with the patented roasting process that keeps the good plant compounds. There could be fat burning and fat storage benefits as well, according to the most recent plant research, although the studies I have read so far suggest that more research is needed. The preliminary research shows that the chlorogenic acid which is in coffee may reduce insulin activity and fat storage. Here's some good news if you're heading for type 2 diabetes. There is research suggesting that coffee can actually support diabetes management and reduces the risk of type 2 diabetes. This is more likely with the Life Extension coffee below because the chlorogenic acid content is double that of regular coffee and it seems to act as an inhibitor to reduce the level of blood glucose and helps to increase insulin sensitivity. This is the opposite of what is usually said about coffee and glucose metabolism. You can buy both and mix them to reduce the caffeine or just drink more of the decaffeinated. This is a coffee that could support you in balancing your blood sugar plus all of the other health benefits. According to some diabetic studies referenced below, it could reduce the risk of developing type 2 diabetes. It's possible to take advantage of the other nutritional facts for coffee and get far more of the antioxidants without overdosing on caffeine! Life Extension makes a rich, healthy roasted coffee 100% certified organic Arabica coffee with beans that are hand picked from the rain forests of Central America. It is roasted in small batches using their patented 100% natural roasting process that leaves in 254% more of the chlorogenic acids. 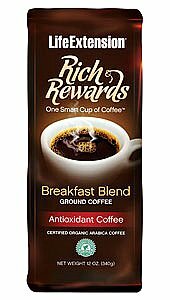 These coffee blends retain the nutritional content of coffee beans with all the antioxidant and weight management advantages. 1. Vinson J. The potential health benefits of antioxidants. American Chemical Society symposium. Aug 28, 2005. Washington, DC. 2. Am J Clin Nutr. 2006 May;83(5)1039-46. 3. Int J Cardiol. 2009; 137:216-25. 4. Am Heart J. 2009 Mar;157(3):495-501. 5. Arch Intern Med. 2009;169:2053-63. 6. J Intern Med. 2004;255(1):89-95. 7. J Natl Cancer Inst. 2011 Jun 8;103(11):876-84. 8. Breast Cancer Res. 2011 May 14;13(3):R49. 9. JNCI Journal of the National Cancer Institute. 2005 Feb;97(4):293-300. 10. Zhang Y, Lee ET, Cown LD, Fabsitz RR, Howard BV. Coffee consumption and the incidence of type 2 diabetes in men and women with normal glucose tolerance: The Strong Heart Study. Nutr Metab Cardiovase Dis. 2011 Jun;21(6):418-23. 11. van Dam RM, Willett WC, Manson JE, Hu FB. Coffee, caffeine and risk of type 2 diabetes;: a prospective cohort study in younger and middle-aged U.S. women. Diabetes Care, 2006 Feb;29 (2):398-403. 12. Eur J Neurol. 2002 Jul;9(4):377-82. 13. J Alzheimers Dis. 2011;25(2):323-35. 14. J Alzheimers Dis. 2010;20 Suppl 1:S117-26. 15. J Agric Food Chem. 2010 Apr 14;58(7):4141-4. 16. Ethnopharmacol. 2010 Jul 6;130(1):93-7. Return from Nutrition Facts for Coffee to Lifetime Fat Loss home page. Return from Nutrition Facts for Coffee to Food Nutrition Facts.